The Sprigs & Twigs team gathers for a company party. As a business owner in a military community, Bill Lillie sees his fair share of families and disabled veterans dealing with hard times—trying to juggle basic daily tasks, such as grocery shopping or shuttling kids to and from school. As a longtime volunteer for GreenCare for Troops, he wants to help take lawn care off that mile-long list. Along with his wife, Linda, Bill Lillie co-owns Sprigs & Twigs, a landscape company in Gales Ferry, Conn. He discovered GreenCare for Troops (GCFT) in 2009, at a GIE+EXPO in Louisville, Ky. He signed up on the spot, received an onboarding package in the mail a few days later and began providing services for military families in need. There is no shortage of families to help in his area since his business is located in southeast Connecticut, near Naval Submarine Base New London, the Navy’s first submarine base. Helping military families hits close to home for the Lillies since in Linda’s first marriage, she was a young Navy wife. “A lot of them are just starting out managing a household or managing a young family for the first time. There’s a great opportunity to help them out and help them get some chores done,” says Bill Lillie. His wife founded Sprigs & Twigs in 1997 as a part-time venture, and in 1999, she made it her full-time job. Bill Lillie retired from his job in the defense industry in 2005 and joined the business. Today, the company has 20 employees and is projected to hit $2.25 million in sales this year on almost entirely residential clientele. Landscape design/build and installation comprises 60 percent of the company’s business, while maintenance accounts for the remaining 40 percent. 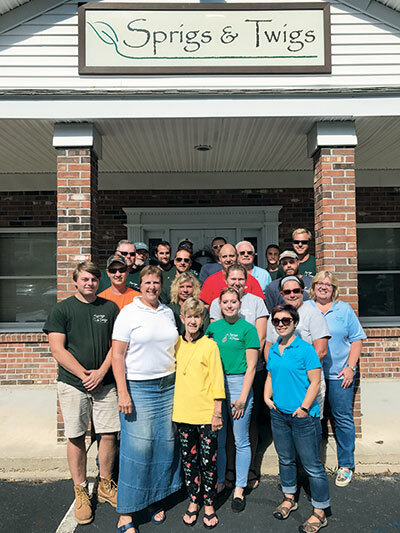 The Sprigs & Twigs team handles lawn care for five or six GreenCare for Troops families each year and transitions those families to snow removal during the winter months. Though keeping up with the scheduling of the military families might be challenging in addition to a full slate of clients, the company’s volunteer coverage area adheres to its regular coverage radius of 30 miles of southeastern coastline and 10 miles inland, which allows it to work the military families into its regular routes fairly easily. To read the full article on how nonprofit initiative GreenCare for Troops is giving the gift of green space—and peace of mind—to military families in need, click here.